How Israel Survives - A Little History - Retrospect ..
Nov 1947 – UN proposes to divide Mandate Palestine into an Arab and Jewish state. 14 May 1948 – Israeli Declaration establishment of the independent and sovereign State of Israel. 15 May 1948 to Jan 1949 – First Arab/Israeli war. Egypt, Syria, Jordan, Iraq, all ripe with the spirit of Arab Nationalism, united under the Arab League attack Israel to prevent its creation. Israel wins war. 1956 – Sinai Campaign. Nasser nationalizes the Suez Canal, Israel, Britain and France invade the Sinai in a bid to control of the Suez Canal & remove Nasser from power. US, US SR & UN force them to withdraw. This ends Britain’s role as one of the world's major powers. 1967 – Egypt, Jordan, Syria, Lebanon & Iraq wage Six-Day War on Israel. Israel wins again, captures the Gaza Strip, the Sinai Peninsula from Egypt, the West Bank from Jordan, and the Golan Heights from Syria. In Oct 1970 Nasser died a mysterious death & Anwar Sadat took his place. 1973 – Egypt, Syria helped by Iraq, Jordan, Saudi Arabia, Algeria, Cuba, Morocco, Libya wage Yom Kippur War on Israel. Israel occupies more territories. This was a Cold War era; the Russians backed the Arabs & US backed Israel. In Camp David (1978) Israel withdraws from Sinai. 1978 – With Camp David the so-called Peace Process starts. It is peace for Israel & status quo subjugation for the Palestinians. 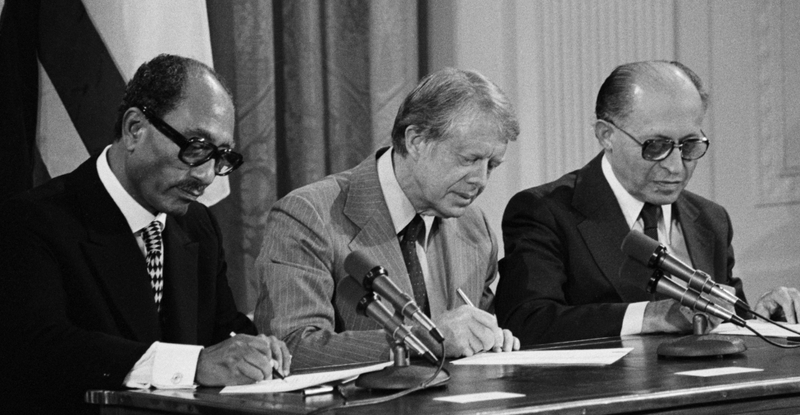 Sadat is taken into the US camp when he signs the Camp David Accord, creating a breach in Arab Unity. Jordan also agrees on a Palestinian Authority with strategic control of Israel on West Bank. In 1980 when Khomeini brings the Revolution in Iran, the US persuades Iraq to go to war against him, they aid Saddam with arms and chemical weapons (the war lasted 10yrs). This war can be seen as the end of the possibility of Arab unity against Israel. You can look at history from so many angles, but if you look at it from Israel’s point of view you will see that from the day it was born Israel faced an existential threat from an Arab World united against it. Winning wars did not mean that the Arabs would stop attacking it or would accept its creation, the only way was to divide the Arabs and join their interests with the US or Israel. And moreover by trapping the Arabs in own wars!